We all tend to lose some strands while combing or washing our hair. In fact, out of the 100,000 strands, it is normal to lose up to 100 each day. When this number climbs a substantial amount higher, it may be time to be proactive. We have uncovered natural home remedies for gentle hair loss treatment. Temporary or permanent hair fall can be the result of underlying health conditions, your emotional well-being, genetics, nutritional deficiencies, and the natural aging process. It can even be due to excessive smoking, use of hair products, and medications. The aging process itself is responsible for the thinning of hair in both men and women once they reach their 30s. 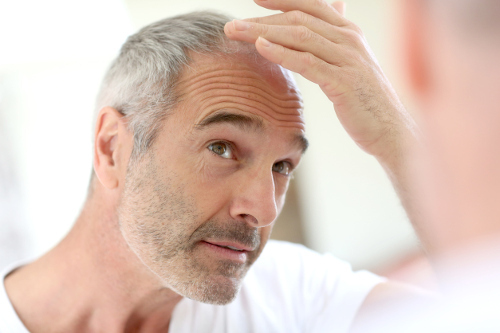 Heredity is the most common cause of complete baldness or partial hair loss. How to prevent hair loss is a common question posed by many patients, especially when it comes to female hair loss treatment. The properties and components of the following natural products work to promote blood circulation to the hair follicles and strengthen hair strands. Take the milk from a coconut to measure one cup. Using a hair dye applicator, brush your hair with the milk. Cover your head with a towel and rinse with cold water after a 20-minute application. A scalp massage combined with the healing properties of essential oils can help condition your hair and reduce stress-causing hair loss through the promotion of relaxation. Apply a few drops of coconut, almond, olive, or argan oil to your scalp and gently massage for several minutes. Rinse and wash as normal. Use the juice from a finely chopped onion and apply it directly on your hair. Leave it on for 15 minutes. Wash your hair with shampoo and air-dry. Crush garlic cloves and boil them for a few minutes with three drops of coconut oil. Once the mixture cools, apply it to your hair. Massage it into your scalp for a few minutes. Leave it on for 30 minutes before washing the mixture out of your hair. Boil 60 grams of washed and dried henna leaves and 250 milliliters of mustard oil until the leaves burn completely. Strain mixture with a muslin cloth and apply it to your head. After one hour, remove it with a shampoo wash and rinse. Take a few hibiscus flowers and crush them with drops of sesame or coconut oil. Mix them together to create a paste for direct application on your scalp. Wash it off with cold water and shampoo after three hours. You can use Indian gooseberry in powder or juice form to create a mixture with lemon juice using one tablespoon of each ingredient. Spread it on your head and leave it until it dries before rinsing with lukewarm water. Using an egg white, create a paste with one teaspoon of olive oil. Apply the mixture to your head for a 15 to 20-minute treatment. Then, wash it off with shampoo and cool water. Remove the gel from one aloe vera stalk and apply it directly to clean hair. Massage it into your scalp and leave it on for 15 minutes before rinsing it off with cold water. Boil 10 to 12 dry Indian lilac leaves until half of the water evaporates. Once cooled, rinse your hair with the mixture. Combine two tablespoons of plain Greek yogurt, one tablespoon of raw honey, and the juice of one lemon. Apply the paste to your hair roots and scalp with a hair dye applicator. After a 30-minute treatment, rinse it off with cold water. Soak two tablespoons of fenugreek seeds overnight. Mash into a paste with four tablespoons of curd, one egg white, and four tablespoons of plain yogurt. Apply the paste to your head and leave it on for 30 minutes before rinsing. Create an overnight treatment with one tablespoon of ground licorice root, one teaspoon of saffron, and one cup of milk. Apply the mixture to your head and cover it with shower cap or headcloth. In the morning, wash your hair. Boil three beetroot leaves until half of the water is evaporated before grinding the leaves. Then, add one tablespoon of henna to create a paste to apply to your scalp. After 20 minutes, rinse it off with water. Steep two green tea bags in two to three cups of boiled water. Allow the tea to cool before removing the tea bags and rinsing your hair with tea-infused water. Peel and chop one small potato. Place it in a blender with a small amount of water to puree. Add one teaspoon of honey and one teaspoon of water to the puree and stir until mixed well. Massage the paste into your scalp for a 30-minute treatment before washing it off with shampoo. Cut and squeeze the juice from two or three lemons into a one-cup measuring cup. Use a muslin cloth to strain the juice into a bowl of one cup of warm water. Rinse your hair with the juice mixture and leave it on for five minutes. Wash your hair with cool water. Grind one cup of chopped coriander leaves and add three to four tablespoons of water. Apply the juice of the paste to your head with a hair dye applicator. After 30 minutes, wash your hair. Take flaxseed oil orally or apply it directly to your hair. You can also drink one glass of water mixed with one tablespoon of ground flaxseeds. Boil fresh curry leaves and your favorite hair oil. Once cooled, directly apply the mixture to your scalp for a 15 to 20-minute treatment. Rinse it off with water. Combine equal amounts of honey, olive oil, and cinnamon to create a paste. Apply this on your head and massage for several minutes before washing your hair. Create a paste using equal portions of aloe vera, Indian gooseberry, Shikaki, and Indian lilac powder. Apply the paste to your scalp and rinse it off with lukewarm water. In addition to the above hair treatments, you can improve and maintain the health of your hair and scalp with adequate nutrition. Certified nutritionist and author Sally Kravich suggests a diet based on nutrients and minerals can help with hair loss. She encourages her patients to eat plenty of omega-3 fatty acid-enriched foods such as fish eggs, nuts, and seeds. Hair loss for anyone, at any age, can be a devastating and embarrassing condition to deal with. There are many factors at play with hair loss such as genetics, medical illnesses and diseases, environmental factors, and stress. Hair loss in women is a major vanity concern. There are dozens of products on the market to help remedy balding spots or to stop hair from falling out. Natural home treatments may also help to stop, reverse, and prevent hair loss.